Acupuncture is an alternative medicine that treats patients by insertion and manipulation of needles in the body. Its proponents variously claim that it relieves pain, treats infertility, treats disease, prevents disease, or promotes general health. The earliest written record of acupuncture is found in the Huangdi Neijing (黄帝内经; translated as The Yellow Emperor's Inner Canon), dated approximately 200 BCE. Acupuncture typically incorporates traditional Asian medicine as an integral part of its practice and theory. However, many practitioners consider 'Traditional Chinese Medicine' (TCM) to narrowly refer to modern mainland Chinese practice. Acupuncture in Korea and Japan, and to a certain extent Taiwan, diverged from mainland China in theory and practice. In European countries such as the UK almost half the practitioners follow these non-TCM practices. The most notable difference is that these other approaches often are primarily acupuncture, and do not incorporate Chinese herbal medicine. The term“acupuncture” is sometimes used to refer to insertion of needles at points other than traditional ones, or to applying an electric current to needles in acupuncture points. Different variations of acupuncture are practiced and taught throughout the world. electromagnetic signals. Stimulating points along these pathways through acupuncture enables electromagnetic signals to be relayed at a greater rate than under normal conditions. These signals may start the flow of pain-killing biochemicals, such as endorphins, and of immune system cells to specific sites in the body that are injured or vulnerable to disease. neurotransmitters and neurohormones. Acupuncture also has been documented to affect the parts of the central nervous system related to sensation and involuntary body functions, such as immune reactions and processes whereby a person's blood pressure, blood flow, and body temperature are regulated. 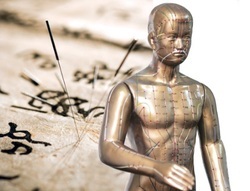 Preclinical studies have documented acupuncture's effects, but they have not been able to fully explain how acupuncture works within the framework of the Western system of medicine. patients. They also have found that using acupuncture lowers the need for conventional pain-killing drugs and thus reduces the risk of side effects for patients who take the drugs. the actual chemical and electromagnetic events that occur during acupuncture will be described.